What a crisp, fresh, and VERY HIGH END GEM! Sensational mirrors super deep and blaze from all over. The mirrors have remarkable clarity and cleanliness.When you twirl the coin the mirrors look like a freshly formed sheet of ice. Both sides have a beautiful mix or totally original aqua blue/pale purple/plum colors.These colors are not dull or drab at all. There actually is light contrast. Miss Liberty and the details are frosted and are fully struck. We really do NOT see what keep this SUPER GEM from a PR67. The eye appeal is gorgeous! Only 540 were minted. 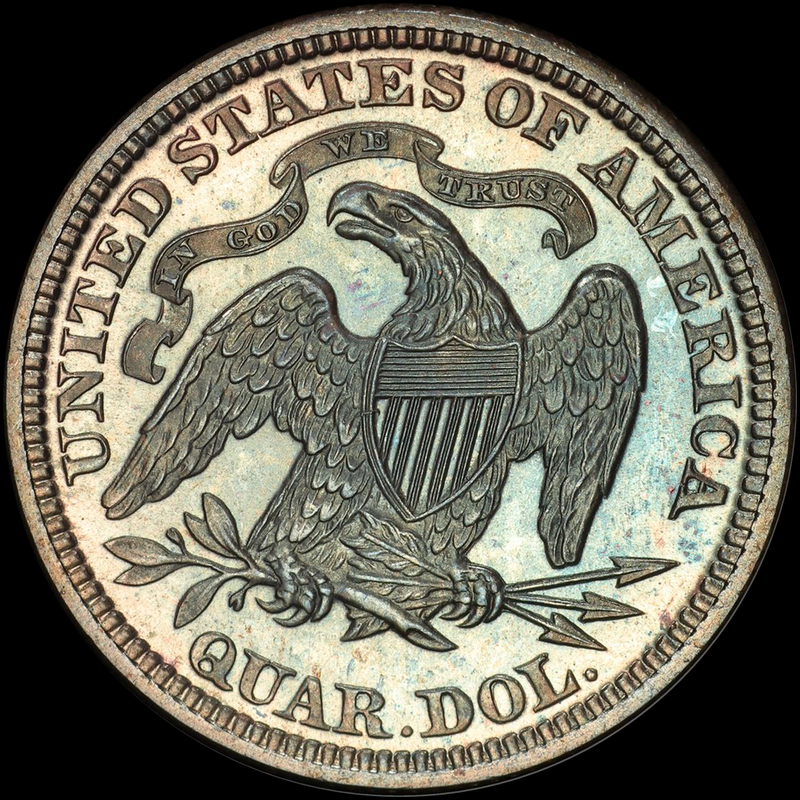 PCGS 5, NGC 10, CAC 4. 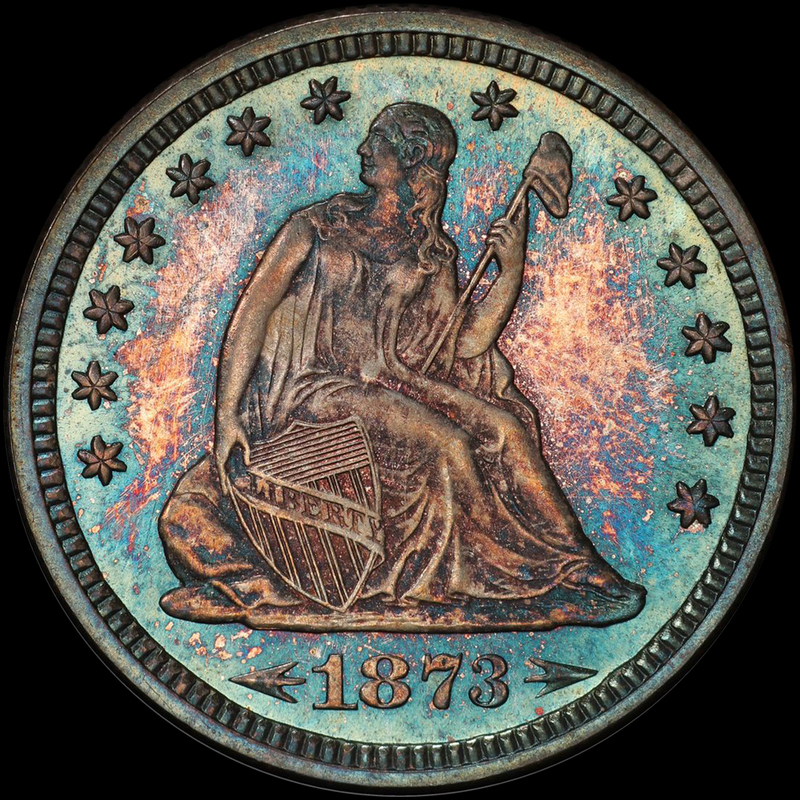 PCGS has graded only one coin finer. This piece is the second finest graded at PCGS . The prices need adjusting upwards on it. You cannot go out and buy another. Or you can buy a dark PR66 for around $8,000.00 (those have a pop of only 5 with one 1 coin CAC. If you are picky and are building a GEM PR Quarter or Type set, this coin is for you!